An extraordinary illustrated history told from the Indigenous perspective and created through a series of workshops, extensive research and community consultation. Honour Book in the 2010 CBCA Awards. In words and pictures Yalata and Oak Valley community members, with author Christobel Mattingley, describe what happened in the Maralinga Tjarutja lands of South Australia before the bombs and after. Christobel Mattingley is the award-winning author of over 40 books, including for Allen and Unwin, Battle Order 204 and Chelonia Green, Champion of Turtles. This is a wonderful book, both visually and textually, engaging the moment I laid eyes on it. I found the presentation clear and precise, exuding confidence to the reader. The Contents page tells the reader what to expect from the book in concise subject/chapter headings. The map at the back of the book outlines the tribal lands which the reader can to refer to as the story proceeds. Also of use is the glossary of Pitjanjatjara words. The fabulous use of strong colours throughout the book offers the reader a positive experience on every page. The telling of the tribal stories in natural conversational format adds an authenticity to the stories and feels right, even though you have to work with the words. The uses of a variety of visual styles further enrich the stories. There are wonderful old black and white photographs, artwork by young students, paintings which are worth a thousand words, colour photographs and lots of traditional aboriginal art. The story is told from the traditional days before European settlement, the struggles that ensued trying to live with white men and their differing values, through the awfulness of the atomic testing until today. We are moved by the simplicity in the telling and angry in hindsight of all the wrongs. The future is unknown but a rainbow set in grey clouds on the final page of the story hints at a perceived promise of a brighter future. Certainly the telling of the story in such a sympathetic and authentic manner ensures readers will come away with a greater understanding of the Maralinga and Anangu tribal story. This is a remarkable book that tells the history of the Anangu people of Yalata and Oak Valley in the western desert regions of South Australia. The reader is able to follow the Anangu people and their way of life both before and after the nuclear testing as told by the people themselves. Each page has a wealth of colour and information presented with the use of Anangu artists’ traditional artwork. The reader is informed about the atomic weapons testing which took place during the 1950s. Missions were closed and communities relocated, leaving many Anangu people homeless and sick from the radiation fallout. Photographs both old and new support a narrative story that is interspersed with eyewitness accounts and anecdotes. The book also show how the traditional Aboriginal ways that these desert people had lived by for thousands of years where disregarded by the white government of the time. I believe that this book is a must read for upper primary classes studying colonization. It’s easy to follow and full of old photos, quotes, Pitjantjatjara words and beautiful artwork. It is an absorbing read about a piece of our shared history. I would highly recommend this book to both children and adults. Employing the genre of a picture book the presentation of this story at first assumes a lighthearted approach to storytelling. Bright endpapers and a title page of reds, oranges and yellows, in conjunction with the blurb suggest a younger audience. However, this ‘story’ is one that needs to be told. At the same time it exposes the treatment of the Anangu people and challenges the reader to question how and why this took place. It confronts society while allowing the Anangu people to share their tales – it is political and it is didactic. The audience of this picture book should be the reading public. The personal storytelling engages the audience providing an insightful and thought-provoking read. The sub-headings throughout the text act as a timeline for the period surrounding the bombs on the Maralinga Tjarutja lands of South Australia. The Yalata and Oak Valley Community have jointly contributed through recount, narrative, photos and artwork to construct this story. The detailed visuals add insight by contextualising the written text. Embedded throughout the narrative is the language most widely spoken by the Western Desert peoples – Pitjanjatjara – enhancing the cultural and personal context of this story. This text is more than suitable for classroom use in both upper primary and high school. Not only is it valuable as a study of Aboriginal History and perspectives, but an excellent example of storytelling, studying the genre of picture books and as a study of representation and text. Australia. Without warning or consultation, Anangu were officially banned from their own traditional lands. The Operation Totem, Buffalo and Antler atomic tests began, along with another 700 minor trials from 1953-1963, wreaking devastation to their homeland. United Aborigines’ Mission, relocation and control of the peoples at Yalata, the Maralinga experiment, the ‘mission impossible’ clean up after the testing (with possibly 24,000 years of hazard from plutonium), moving to Oak Valley, and the ongoing land claims of today. It presents the human face of the Maralinga bomb tests, resultant contamination, sickness and death. Glossary) and extensive personal memories from many community members in an outstanding, collaborative and engaging story of survival in the face of appalling mistreatment. Eye-catching end papers, photographs and striking traditional art works created through community workshops, complement the text. Maralinga, the Anangu Story is a unique, beautifully presented oral history telling the story of Maralinga from the perspective of the Anangu people. The indigenous elders and community members of Yalata and Oak Valley worked with renowned Australian author Christobel Mattingley to tell their own story. The book starts with the Story of the Land, its animals and birds and plants and its people, the Anangu. Using traditional storytelling skills and beautiful artwork plus original photos, the story of the Anangu unfolds as Europeans come to their land and bring change with them in many forms such as missions and the railway. They also bring the atom bomb in the 1950s. In 1953 the site where the explosions took place was named Maralinga by the whitefellas. They took the word from an Aboriginal language of northern Australia. It was not an Anangu word. Translated, Maralinga means thunder. They thought it was appropriate to describe the sound of the explosions. Oral histories tell of "the black mist and fallout" when the first two bombs were exploded in 1953. The stories and descriptions of the impact are revealing and distressing. At Wallatinna, the property in the centre of the fallout path, a black mist with a metallic smell enveloped camp sites. It had a severe impact on the Anangu who suffered a range of serious medical effects. They also worried for the effect on their land, their country. The stories of the impact on Anangu people are heartbreakingly sad, not only the effects on their health but also their grief for their country and the loss of their country when they had to move to Yalata. In 1984 legislation finally handed the Maralinga lands back to the traditional owners. They called their new home Oak Valley. 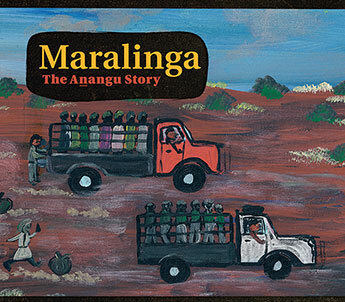 The book ends with: ‘Maralinga the Anangu Story is our story. We have told it for our children, our grandchildren and their children. We have told it for you.’ This book should be in every school. “Long time ago, before whitefellas came, Anangu lived on their lands for thousands and thousands of years. The land was their life. They loved the land. They cared for the country. They knew all its secrets and they taught those secrets to their children and their children’s children, tjamu to tjamu (grandfather to grandson), kapali to kapali (grandmother to granddaughter).” So begins Maralinga, the Anangu Story, which tells the story of the Anangu people of the western desert area of South Australia. Their history, from the Tjukurpa (Dreaming) to the present, is told in their own words and seamlessly woven together with primary documents, illustrations and photographs to present a detailed and deeply moving history of the Anangu people. The book begins with beautiful descriptions of the traditional life of the Anangu, with chapters on the Dreaming and the importance of water and bush tucker to this desert dwelling people. This contrasts with the arrival of the walypala (whitefellas), described as like a “trail of termites” which “began to undermine Aboriginal lifestyle and culture”. Subsequent chapters describe first contact with the explorer Edward John Eyre in 1840 and the devastating effects on the Anangu of the construction, beginning in 1912, of the railway from Port Augusta to Kalgoorlie. For the remainder of the century the Anangu were at the mercy of the government, as they were repeatedly relocated from their homeland. Firstly they were moved to various Christian missions, and then again when their country was chosen as the Woomera long-range weapons test site in the 1940s, followed by the testing of atomic weapons at Maralinga in the 1950s and ‘60s. The personal recollections of the effects of the atomic fallout and subsequent contamination of the country are very moving. The final chapters describe the movement towards Aboriginal self-determination and land rights. The closing chapter, 'We Have Survived', includes the hopes and ambitions for the future of Anangu school children at Yalata community, and could be used in the classroom for making connections by students with their own dreams. The book includes a useful glossary of Pitjanjatjara words, a map of the area and an extensive bibliography. The great strength of this book lies in Christobel Mattingley’s careful balancing of the experiences and feelings of the Anangu with both personal and official observations of explorers, missionaries, and government officials. I highly recommend this book, both as an exceptional text for studies of Aboriginal and wider Australian history, as well as useful resource for teachers who feel hesitant about teaching in this area because of their own lack of knowledge. The complementary Teachers’ Notes by Fran Knight are also recommended. 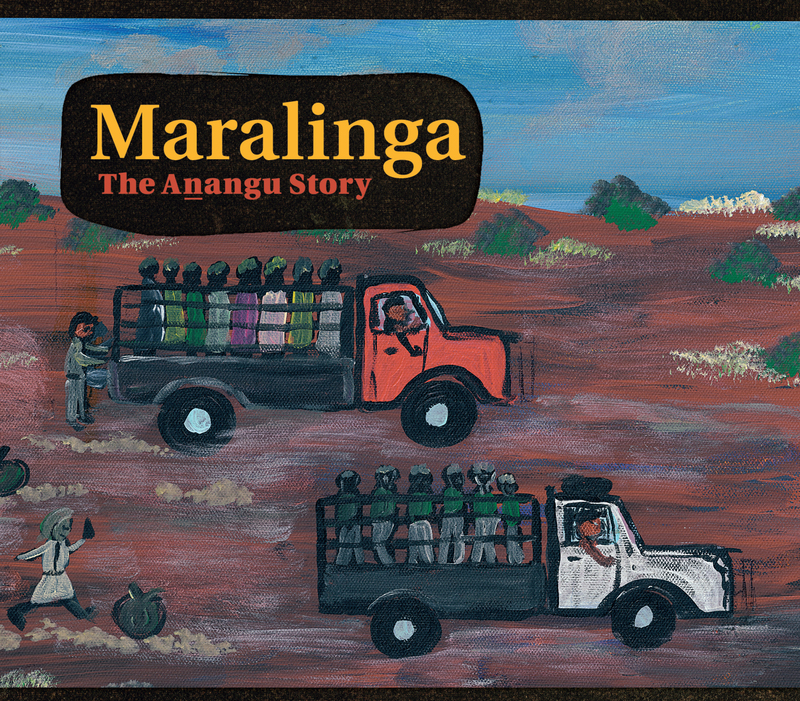 Maralinga, the Anangu Story is appropriate for senior primary and secondary students as well as adults and should be required reading in all Australian schools. Australia’s north and west, from traditional times to today. The chapters about life before Europeans include information about water and its importance to desert living people, bush tucker and how the landscape was formed. The majority of the book is about Anangu lives since the arrival of walypala (explorers). Included are the coming of the railway, Daisy Bates, the Ooldea Mission and the infamous atomic testing. This important and disturbing story is told through the stories of aboriginal people (including the senior Anangu men’s remembrance explorer Edward John Eyre) as well as quotations from official government documents and other documents, linked by Christobel Mattingley’s narrative. The book is colourfully illustrated with historic photographs and paintings by the Anangu people. It includes a map and a glossary of commonly used Pitjanjatjara words. This book belongs in every school library. The story told is something all Australian should be familiar with. It also is a useful classroom book (either as a textbook or wider reading book) as well. This is not just a South Australian story, but an important Australian story. Could it all happen again? One hopes we have all learned from this story and others like it. "Long time ago, before whitefellas came, Anangu lived on their lands for thousands and thousands of years. The land was their life. They loved the land. They cared for the country. They knew all its secrets and they taught those secrets to their children and their children’s children, tjamu to tjamu (grandfather to grandson), kapali to kapali (grandmother to granddaughter)." So begins the beautifully presented and engaging non-fiction text Maralinga, the Anangu Story. The text marries together narrative with first-hand oral accounts of the life of people who live in this remote area of Australia. The narrative begins with Anangu traditional beliefs (as told by Anangu people themselves). It continues with a narrative about white invasion and how this affected the Anangu with the coming of white products, diseases and missions. The development of the railway had a significant and somewhat negative impact on the Anangu as it changed the Anangu way of life in desert. What is particularly engaging is the narrative and first-hand accounts of the atomic bomb testing in Maralinga in the 1950s/60s and the hugely detrimental effect on the Anangu people. The Anangu perspective is emotively presented through first-hand accounts, drawings and photos and even tracing one particular family’s story. The speakers represent their experiences with illness as a result of the radiation. The Anangu continues with telling the story of their fight for land rights and to return to the land of their ancestors. The text ends with the Anangu testimony of their survival and hope for the future. The power of this text is that it is told from the Anangu perspective, not only using Anangu words/phrases but also representing their way of thinking and world view. Oral testimony is pieced together, coupled with beautiful indigenous illustrations that bring to life an intense, personal and evocative and story. The end of the text repeats the same idea as in the beginning but adds the last words – “we have told it for you” – and that is the essential idea of the text. Ultimately, it is about drawing us in and helping us understand this important part of Australian history from an Indigenous perspective. This non-fiction text could be taught to different age-groups and easily incorporated into new or existing units of work. It could be taught in a unit exploring features of non-fiction texts, or a unit on indigenous literature (matched with other texts representing Indigenous experience) or more broadly it would be effective in a unit on Australian experiences represented in texts. This text would also be an effective supplementary text for the Year 12 English unit on Belonging. Maralinga is a challenging story about the Anangu and what happened to their land and them as a people before and after the bombs. It is written from their perspective and presented in both words and pictures making it an information text accessible to both upper primary and secondary students. The book is split into chapters including 'Bush Tucker', 'Invasion', 'The Railway Comes', 'Fallout', 'Land Rights' and 'Back to the Lands'. Each chapter offers something interesting whether an old black and white photo, drawing, colourful art work or a personal recount. These all work together to capture the attention of the reader and create an accurate picture of the historical events that took place. Christobel Mattingley writes with sensitivity and an integrity which makes this book a useful resource for students studying Australian history. I particularly enjoyed the chapter on Daisy Bates, a missionary from Ireland, and her diary account of her time with the Anangu people. A fitting chapter, 'We Have Survived', concludes the book with a beautiful photograph of a rainbow. There is a sense of hope, despite the tragedy that has befallen this tribe, for the future of these amazing people. Our year 5/6 class studied Aboriginal Culture this year as one of their General Studies units. This can often be a challenge as many resources on this topic are aimed at informing children about traditional life. I was inspired by the book Maralinga to explore with the children in greater depth, the journey and issues surrounding one tribe. Maralinga Tjarutja lands before and after the bombs. It tells the story of the earliest beginnings, white invasion/settlement, life in a mission and the devastation left behind by nuclear testing. It combines the English and Aboriginal language with aboriginal artwork and historical photographs to produce a book to be cherished for years. It is an honest and factual work of culture and history that tells it as it was. I became quiet attached to the women in this book and the early way of Aboriginal life. I questioned whether our environment would be in the state it is today if we had continued to respect our land as the Aborigines do. Should it not have been the Aborigines who taught the white man a few things all those years ago? After recently reading Paula Shaw’s Seven Seasons in Aurukun, which introduces an Aboriginal community from the perspective of a white teacher, Maralinga was a welcome introduction to Aboriginal life and white man invasion from the other perspective. Due to the information enclosed in this book I feel it would be suitable for upper primary and secondary students. It is a great study on Aboriginal culture, our land and Australian history. Tragic. This story really punched me in the belly. Describing the hardships of this group of Aborigines as they were kicked off their land, made sick and killed by the British and Australian governments, this story is a must read for absolutely everyone. It is a heartbreaking and eye opening story that would open up many classroom discussions.